Lake Tahoe is one of the most sought after ski vacation destinations in the US, and once you’ve seen it with your own eyes, you need not wonder why. As the largest alpine lake in North America, there are 72 miles of shoreline spilling into California and Nevada. The cold lake waters are crystal clear mirrors to the endless azure sky, creating an awe-inspiring effect of immeasurable blue. As if that wasn’t enough, the lake is surrounded by the famous Sierra Nevada Mountains covered in sparkling snow and pines. The vastness of the area is separated into two main areas: the North and South Shores. Both are equally as scenic, but different in their offerings. The North Shore has the majority of the ski resorts, but the South shore has the largest and most popular ones. The South Shore is also bumping with a myriad of entertainment some within walking distance or just a short cab ride away. I suggest planning your trip to the South Shore instead of the North, especially if it’s your first time, just to get a good feel of all that Lake Tahoe has to offer in a more condensed and navigable way. The following list is comprised of options for South Lake Tahoe you can take into consideration when planning your ski trip. Driving – It is definitely the most straightforward way, but it doesn’t go without its hassles. Weather alerts and tire chain requirements can add impediments and headaches and should be considered in advance. Flying – The closest commercial airport is the Reno-Tahoe International Airport (about 1 hr away from South Shore). Continental and United Airlines offer direct flights to Reno from San Francisco International Airport. South Tahoe Express offers 10 shuttles daily from the Reno airport to South Lake Tahoe resorts or you can rent a car. Train/Amtrak – The California Zephyr Amtrak combined bus/train service picks up in San Francisco Union Square (bus) and Emeryville, CA (train) and travels to the Truckee, CA station. Bus – There are bus services and rideshares from San Francisco Bay area with varying schedules and pick-up times. AlterNetRides is a website that coordinates rideshares, and you can also call your resort in advance to see what shuttles they offer from Sacramento, Truckee, and Reno. 2. Staying there: You really have your pick when it comes to choosing accommodations in South Lake Tahoe. They range from cream of the crop luxury hotels to salt-of-the-Earth rustic cabins. There are campgrounds, RV parks, bed and breakfasts, hotels, resorts, and even vacation homes fully equipped with additional amenities such as kitchens and laundry. Visit the South Lake Tahoe Official Site for detailed lists of accommodations. 3. 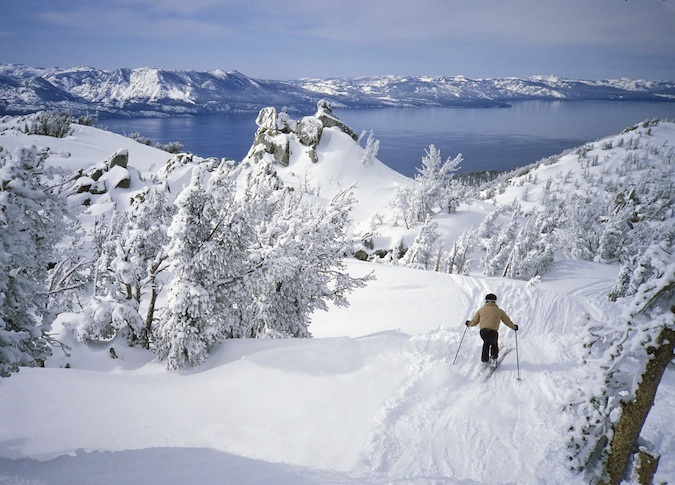 Skiing there: With 40ft falling per year, the snow in Tahoe is the main winter attraction. There are three major ski resorts in the South Shore. Heavenly Ski Resort has the largest ski area and according to OnTheSnow.com it is the 2nd mos t popular one in the US. The other two resorts are Kirkwood and Sierra-at-Tahoe. All three offer diverse slopes to fit skill levels of beginners, intermediate, advanced, and extreme terrain. If you are showing up sans equipment, no need to fret. You can rent skiing and snowboarding equipment on site (or offsite if more convenient) and even take instructional lessons if needed. For a complete listing of ski resorts, please visit Tahoe.com to see which resort is most appealing. 4. What else to do there: South Lake Tahoe is a large community filled with food, nightlife, and entertainment. Gone are the days of hunt and gather, you can fill up at 4 star restaurants, buffets, chains, diners, and more. After replenishing over a meal, you could head to one of the many casinos on the Nevada side to test your luck. Once you’re rolling in the gambling winnings, you can move onto a ritzy nightclub for VIP treatment, a hipster dive bar for some low-key fun, or even a pub or dance club. South Lake Tahoe is a bustling destination that offers an amazing balance of natural beauty and endless entertainment for a full sensory experience. You will not be disappointed by all the variety in store for you when planning your next ski trip vacation. For any additional information, please visit the Official Lake Tahoe Visitor Bureau Website. April Reed calls San Francisco home but radiates out as far as a weekend can take her. She has a penchant for the great outdoors, preferring snow and sun in equal parts, but is always willing to bask in the pulchritude of the world.